"A mountain range on the horizon separates the cloudy sky from the dusty desert soil of the El Mirage Dry Lake, with the sounds of a distant roar. In the long shot, the gaze shows a detail of the Californian Mojave landscape, whose static panorama forms the referential and also material background for Circular Inscription. 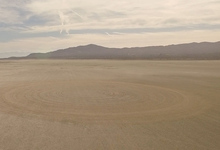 In a performative tracing of a vehicle’s path, Lukas Marxt initiates and documents in his cinematic work, the process of inscription that gives the film its title: a seemingly unmanned white car rolls into the image and begins to spin in eccentric rounds in the middle of the dried out lake. The vehicle draws its circles uniformly, from inside to outside, the squealing of the tires continuously rising. In doing so, the tire tracks furrow spiral-shaped in the desert surface, leaving behind marks in the soil of this culturally imbued landscape - a favorite shooting site for Hollywood films and advertisements, a popular venue for car races and their media exploitation, a site tightly bound to the art-historical movement, Land Art.